Silver Lining Auto Restoration is a family business located in Silverton, Oregon. While still a relatively young shop, we are enjoying our quick rise and notoriety in the competitive automobile restoration space. The vision for Silver Lining Auto Restoration came many years ago when owner Morrie Hozen was fifteen years old. Morrie's father gave him a rundown classic car, some tools, and told him to get to work if he planned on driving at sixteen. He didn't realize it at the time, but this project was used to inspire motivation and teach the value of breathing new life into a beauty. 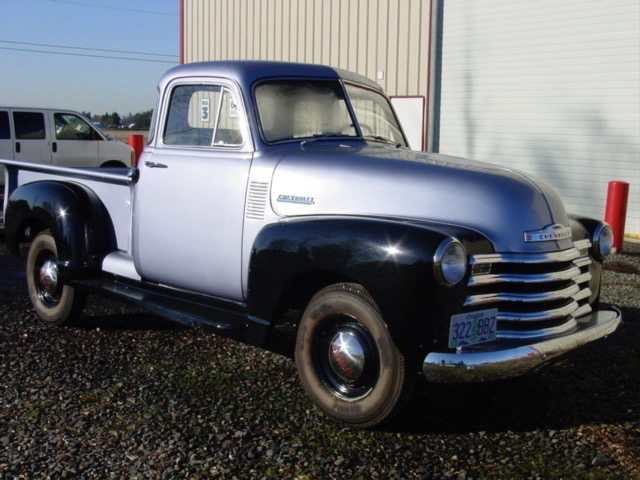 The owners first automobile project (Chevy truck pictured on page) is where the he fell in love with classic cars, and the passion and restorations never stopped. After high school, Morrie Hozen started an electronics business, and while the success was great, it lacked purpose. Dreaming about what his perfect day would be like the same vision kept coming back over and over, restoring classic cars. In 2012, Morrie decided to take a huge leap of faith, close down his successful electronics business to open an unproven restoration business that allowed him to follow his dreams. Before starting the new company, Morrie talked to countless auto enthusiasts in various stages of their restoration projects. He asked tons of questions to learn what customers wanted in a restoration shop, what were the biggest challenges and headaches. After listening to enthusiast after enthusiast, a pattern began to emerge that became the foundation of what has helped to make Silver Lining Auto Restoration so successful in such a short period. Lead time was the biggest frustration for people working to get their beloved automobiles restored. It was common to hear horror stories of projects taking years to complete and shops acting more as storage facilities then restoration shops. Top quality work with skilled labor on deck to make weekly progress on projects is a foundation of the shop. Seeing constant progress is a part of our culture and keeps everyone excited about the final delivery. The second biggest frustration that was shared by people that had gone through the restoration process was price quoting and large deposits. It was common to hear about quotes that doubled from the start of the project to the end. While we know that many of us have been burned by low-price offers, it is hard to resist the hope that maybe it is possible to find a great deal. With that in mind, we decided that we would do our restorations the old-fashioned way, time plus materials and a handshake instead of a deposit. If a customer is ever unhappy with the value or speed of our work, they are welcome to grab their vehicle (yet to happen). Without requiring large deposits, our customers can work with us to a mutual benefit and value exchange versus feeling trapped by a large deposit or contract. Long story short, we have a passion for auto restoration and we will always try to do what we say and stand behind our work. We are interested in learning about your restoration project. Contact us anytime and lets talk about making your automobile dream into a reality.